**DISCLAIMER: WE ARE NOT AFFILIATED WITH NOR DO WE SELL DECADE. THIS ARTICLE IS INTENDED AS AN OVERVIEW TO HELP GOLFERS LEARN MORE ABOUT THE PRODUCT. It is no secret that golf is a game of mathematics. From launch angle to handicap, we are constantly calculating our odds, our errors, and our rank. And as technology advances, so does our ability to access the statistics that will help us become better golfers. You have likely noticed the increasingly important role of advanced data in golf training over the last few years. This surge in statistical analysis has led to game-changing insights. However, no one has run with the game-altering power of data quite like Scott Fawcett. Fawcett’s course-management system, DECADE, has all but turned the world of competitive golf on its head. In less than four years, the DECADE strategy has been used by PGA Tour winners, eight USGA Champions, and two NCAA Champions. And that’s just the tip of the iceberg. Players who have attended the DECADE seminar swear by Fawcett’s strategy. The DECADE app is in use by 18 out of the top 25 collegiate program. Amateurs and pros alike depend on this math-based approach to stay sharp and competitive. However, what is perhaps most interesting about Scott Fawcett’s strategy is not that he has found a way to work the stats. Rather, it’s that Fawcett’s system uses the stats to change the psychology of the entire game. In over-simplified terms, DECADE is a course-management system that helps players select their optimal target on any given hole. Scott Fawcett’s strategy discourages players from constantly prioritizing the pin. Instead, he teaches a method of evaluating multiple factors, including individual distances and hazards, to focus on the ideal target for the specific golfer, hole, and scenario. However, DECADE is about so much more than target selection. The point that Fawcett drives home time and again is that golfers are not shooting with a sniper rifle, but with a shotgun. He illustrates this point with the images from ShotLink. When you see the shot patterns of the pros, you see that no one is making precision shots. That’s not a realistic goal. Rather, the goal is to strategize each shot to make the most of the shotgun effect. This is where the psychology of DECADE comes in. Scott Fawcett himself attests that the psychological benefits are the most valuable aspect of the DECADE system. In fact, his live seminar opens with the advice to “stop trying to make birdies and stop trying to make putts.” Instead, players are encouraged to focus on following the strategy and firing at targets. When they switch focus in this way, Fawcett says, they discover a new confidence and patience on the golf course. This makes sense. Golfers who use the DECADE system are banking on a math-based strategy that essentially lays out the best decisions for them. This way, you don’t have to sweat each shot based on how well it sets you up for a birdie. Instead, you focus on firing at each target, trusting the system to get you where they need to be. Fawcett emphasizes a remarkably grounded perspective of golf. The game is difficult. The players are imperfect. The challenges are many. Therefore, each golfer needs to make peace with the reality of their own shotgun shot patterns. Once you’ve done that, you can learn how to work with the imperfections and challenges of your game. You can give yourself the best opportunity, and you can keep a clear head as you approach a ball that didn’t land where you wanted it to. In short, DECADE is as much about expectation management as it is about course management. That said, reaping the psychological benefits of DECADE means you have to trust Fawcett’s strategy to begin with. Let’s talk about why you can. Perhaps one of the most interesting aspects of the DECADE system is the background that inspired its creation. Scott Fawcett is a former pro golfer, but his expertise goes beyond the sport itself. Fawcett has multiple math degrees. He also has a fiercely analytical mind – one that led him to take an interest in professional poker. It was partially his extensive study of poker that inspired his approach to expectation management in golf. This fact alone already sets Fawcett apart as a revolutionary thinker in the sport. While poker requires strategy and skill, we still view it as a game that can never be entirely within our control. The best we can do is play the strategy. When we are on the golf course, however, we tend to hold ourselves to stricter standards. By employing the principles of expectation management Fawcett learned in poker, he opens up an entirely new perspective for golfers. And the results speak for themselves. 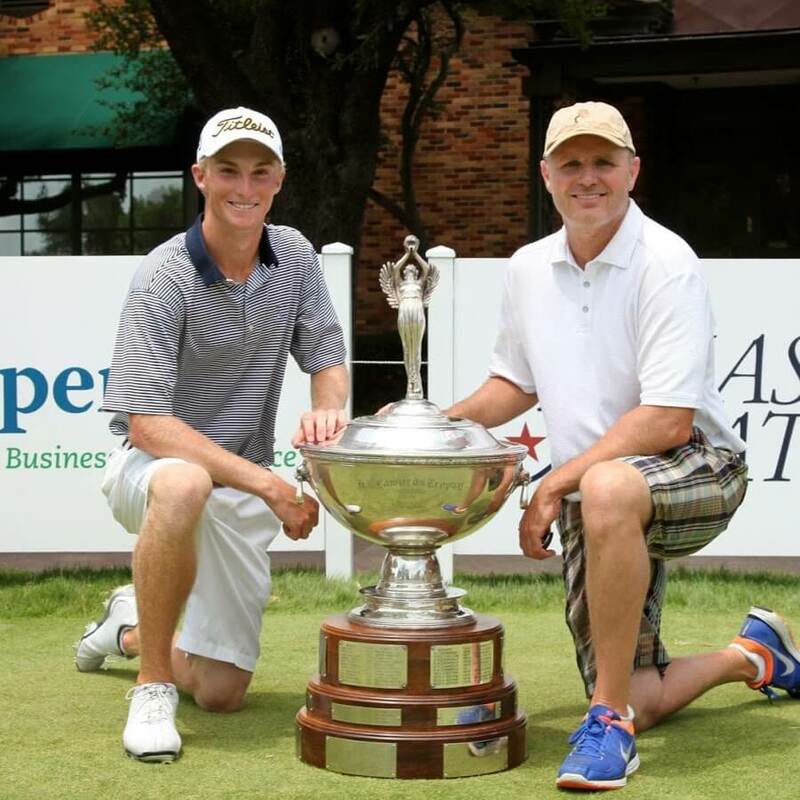 Scott Fawcett (right) with Will Zalatoris after the 2014 Texas Amateur Championship. Scott Fawcett first designed his math-based system for his own use. However, when an injury kept him from competing, he used his new system to help a junior amateur from his home club. Under Fawcett’s guidance, that golfer won the Texas Amateur, Trans-Miss Championship, and the U.S. Junior National Title. He went from ranking at #3,300 to #3 in three months. The DECADE system has only taken off from there. Fawcett’s strategy and statistics have led five players to become #1 in the world. DECADE has been used by PGA tour winners and has become a staple in collegiate programs. It is heralded by players at the professional and amateur levels, and for good reason. Fawcett has not only brought a new perspective to the game of golf, but he has worked hard to ensure its accuracy, from combing through PGA ShotLink statistics to analyzing the over 2,000 holes of (winning) golf he’s caddied. Having proven his method through seminars and one-on-one work, he then made DECADE into an app. There are technically two different DECADE apps: DECADE Elite and DECADE Lite. DECADE Elite, as you might guess, is best suited for pros and competitive amateurs. DECADE Lite is designed for less experienced golfers. The targets provided in DECADE Lite are more general, and the app overall is intended to introduce the system without overwhelming a player who is still learning. Once a player breaks 80, a player may transition to DECADE Elite. The app contains the information from Scott Fawcett’s seminar distilled into about two hours of video instruction. In addition to learning the DECADE system and selecting targets, players then use the app to track statistics. These statistics include their own data, as well as trends among their peer group. Data input takes around ten minutes, but the payoff is potentially huge. The app stores the user’s information and all stats can be filtered. Viewable categories include “Last (1/3/10/20) Rounds,” “Season,” “Practice,” “Tournament,” and “Qualifying.” Users can even view data from specific areas of their game. Finally, DECADE boasts a Comparative Analysis feature, enabling you to see how you stack up within your peer group. And if your game is floundering, the app doesn’t leave you hanging. New content is regularly added, and the app even recommends videos to you based on the needs of your game. It would appear Fawcett has thought of everything. While Scott Fawcett did not invent data analysis as a means of mastering a sport, he has revolutionized the way we view statistics in golf. His DECADE system helps golfers select optimum targets based on a mathematical understanding of the game. In other words, DECADE reveals the smartest decision a golfer can make on any given hole. Moreover, Fawcett’s strategy occasionally reveals that the smartest decision is not always the one that looks the most impressive. In fact, the cold, hard statistics behind DECADE force golfers to see the truth about their sport. The truth is that golf is challenging. Not even the greatest pro shoots precision shots every time. By changing these expectations, Fawcett has changed the game itself for hundreds of golfers. He has helped pros and amateurs alike take their focus off of birdies and put it back on their targets and strategy. He has helped players discover patience with the process and satisfaction with their performance. And as any golfer knows, patience and satisfaction are already game-changing assets, never mind what it means for your scorecard. What do you think? Have you been following Scott Fawcett’s game-changing innovations? Have you tried the DECADE system for yourself? Let us know your experiences, questions, and opinions in the comments below! If you’re newer to golf and would just like to learn the basics, check out our 5 Best Tips for Beginner Golfers. Previous post: The Skill Code by Cameron McCormick: Should You Try It? Next post: Square Strike Wedge: Have You Tried It?